Zork I: The Great Underground Empire. Zork is a text-based interactive adventure game that was written in the late 1970s. What Zork lacks for in graphics it makes up in the rich storyline and mystery of not just the plot, but trying to figure out how to go about playing the game. Zork will take adults back to memories of early gaming and while kids might first be bored with it, they'll easily get hooked with the mystery and start using their problem-solving skills to solve the game. Keep reading to find out how to play Zork and some tips and tricks to help you finish the game. Looking for more retro games? Try your hand at free online versions of Same Game and Pacman. Visit iFiction to play Zork I: The Great Underground Empire. Since this is purely a text game, you must read the text on the screen to understand what to do throughout the whole game. My suggestion on how to first approach this game is by just trying out some text commands. Enter what you think would be a normal response to the questions and comments that you're asked and presented within the game. Type a command and press the Enter key on your keyboard to input it. You'll either get a response that makes sense with the storyline, something humorous, or a reply with a message like "I don't understand that." In the next section below is a link to a lot of other Zork commands. You should be aware that there are lots of variations of this game online, so while some commands will work for one game, they may not work for another. One example can be seen with this game on iFiction in that you can not save and restore your progress, even though other versions of Zork on other websites may very well support those commands. If you find yourself a little stuck while playing Zork (which is completely acceptable given how different it is from other online games), I suggest you take a look at this Zork command list. This will hopefully get you unstuck and back into the game. There are lots of commands for moving around in the game as well as item commands like drop, open, throw, get, etc., for interacting with things that you encounter. If you find yourself really stuck, then take a peek at this Zork walkthrough. Don't ruin the fun though, no peeking until you're really stuck! I love Zork. 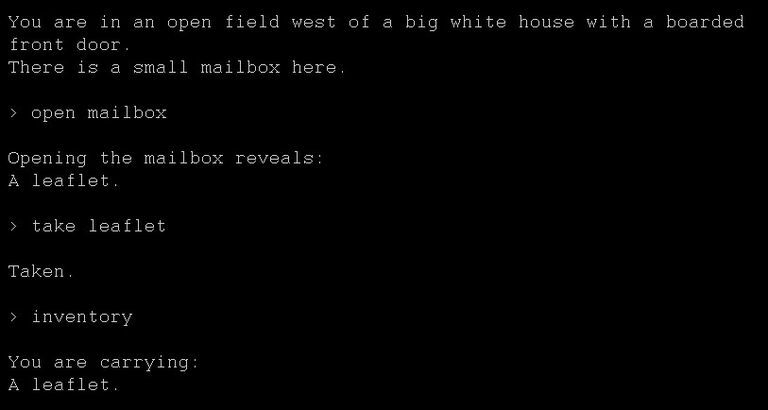 I remember when the only type of computer games I had access to were text adventures, so Zork brings back a lot of fond memories. Also, the storyline is fantastic. There was some real thought and love put into this game, and it shows. However, Zork definitely isn't suitable for everyone, especially anyone who is used to playing on graphical games. With just text and therefore zero graphics, and the fact that you must then read through the game like an ever-changing book, Zork takes some extra effort to play than visual games that just require a few controls. However, with that being said, maybe you can take a break from your regular style of games and see just how much fun Zork can be.